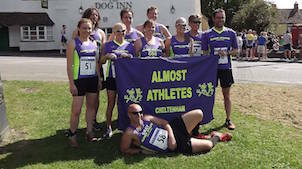 We are an established club and have been encouraging members to get the most out of their running for over 20 years. Come and join us - whether your interest is running for fun, getting fit, or training for anything from a 5K race to a marathon, we can help you achieve your aims. Anyone is welcome to come along to our regular training sessions and run - regardless of age or ability. We have groups of different speeds to accommodate everyone so you can run with like-minded people and make new friends. We organise evening runs and weekend runs - both on and off road - and we have a great social calendar including quiz nights, bowling, BBQs and running weekends away. Come along on a Wednesday night and see for yourself!